Many artists get asked the question, “What is your creative process?” I think most artists would say that it just happens and that they don’t have a particular process. Why some people are artists, musicians, writers etc. and others are athletes, business people, social workers etc. is a magical mystery. I never considered myself a creative person, nor did I grow up in an artistic atmosphere. I was raised near the ocean where outdoor sports was the way of life. I played tennis; my parents were golfers and my brothers surfers. In school, I excelled in sports and did not pursue writing, music or art. Artistic pursuits weren’t even a consideration. In 1972 I learned the Transcendental Meditation technique. One of the first things I noticed as a result of the practice was that I had all this extra energy, which needed to be directed into some channel. I took up cooking. After about two years I started to hear words and phrases in my head. I began a journal to write down what I was hearing. Sometimes I would write prose and on occasion I wrote a poem. In time poems, or the first couple of lines, began to sound inside my mind. Soon I started to hear melodies as well. I did not consider myself to be musical. I never even thought of trying out for the school singing groups as I did not have a strong voice. However, I had a passion for listening to music and alone in the car, I would sing away to the songs on the radio. I also listened to my records for hours in my room. What was happening inside me? Why was I starting to hear and write songs and poems? During my meditations, I experienced a deep level of silence. It was like a crystal, still pond that I could also visually see. I realized I was accessing the source of all sounds, words, and music — the field of infinite creativity. Also, the surface noise in my head — anxiety, pressure from work, to do lists, etc. — was dissolving as stress was released due to the deep rest I gained during TM. Accessing this field of pure silence twenty minutes twice daily in my TM practice unleashed this flood of creativity. Being clearer headed was allowing me to perceive the stream of creativity that was rising from this very still level within. Many artists and musicians describe this effortless experience of creativity in which they feel they are not doing anything and the process of creation is happening by itself. The following poem called “Am I the Poet?” expresses this effortless flow of creativity. of each expression rising from within? beyond all meter, beyond all word . . .
Am I the writer of these lines? in any way the wind blows . . .
of the sounds of silence singing? for me to be silence’s instrument . . . Some people are naturally born with specific creative abilities and also seem to have a deep connection to the spring of creativity within themselves. However, I know now first-hand that anyone can develop their creativity if they first tap into the field of silence and infinite creativity by practicing TM. Creativity is not just limited to the arts. Mothers have to be resourceful every day in raising children. In business, creativity is the name of the game. Every act of life can be a creative endeavor. The flow of creativity is intensely joyful. If you want to unleash the waves of creativity in your life, dive into the depths of your consciousness to the infinite source of all creativity and you will soon enjoy the effortless flow of a more creative, happier, and fulfilling life. 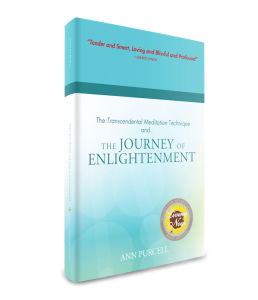 Ann Purcell is the author of the book The Transcendental Meditation technique and the Journey of Enlightenment. She is a regular contributor to Huffington Post. In addition she is a singer-songwriter and has produced many CDs including her recent release, You’re a Hero— Songs for Children. Check out her blog Enlightenment is for Everyone. Listen to the title song You’re a Hero. It’s not often that a fifteen-year-old girl from Salt Lake City finds herself auditioning for the School of American Ballet. And even less likely that the aspiring ballerina gets accepted, graduates, joins the New York City Ballet corps de ballet at age eighteen, becomes a soloist by the time she’s nineteen, and a principal by age twenty. Rarer still for this talented dancer to take the leap from ballet to Broadway star, dazzling crowds and critics alike. It doesn’t sound real, yet this is the life of Megan Fairchild, age thirty, who is starring in the current revival of the Broadway musical On the Town to great acclaim. My level of pushing my body was up so high that, basically, a fuse would blow. With TM I turn my stress dial back a little bit every day instead of letting it constantly turn up and build on itself. Megan has agreed to an interview one morning after performing the evening before. Here she talks about technique, artistry, and her life as a ballet dancer and Broadway star. 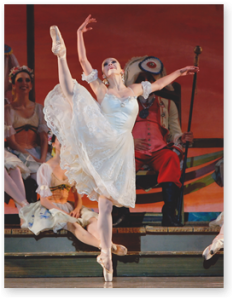 Linda Egenes: What made you take a year off from your successful career with the New York City Ballet (NYCB)? Megan Fairchild: I think it’s no coincidence that my little opportunity happened after I learned Transcendental Meditation almost a year ago. Just five months after starting TM, I got a text from the casting director of On the Town, wondering if I’d be interested in auditioning. That was a really important moment for me. Normally I would have been too shy, or would have thought no, that is not me and stayed in my little bubble. Instead, I was thinking that I am at a point in my career where I am ready to try new and different things, and this could be an exercise in jumping out of my comfort zone. I honestly believe that TM had something to do with that decision. Linda Egenes: How is performing on Broadway different from ballet? Megan Fairchild: It’s more fun than I expected. Not that there isn’t pressure on Broadway, but there is a little bit more of an “it’s just entertainment” kind of attitude, as opposed to ballet where everything has an ideal or perfect line that you are trying to create. 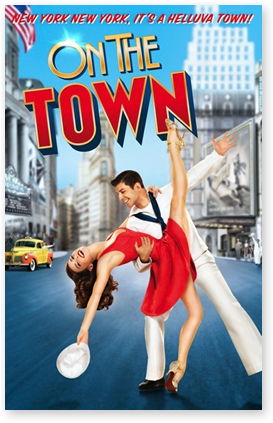 There’s a lot more freedom when dancing on Broadway. Linda Egenes: Would you say it’s less stressful? I mean, there’s a popular perception that ballet is a stressful profession. Megan Fairchild: I love my job at the NYCB because I love the people I go to work with. I love the jokes that we share and the sense of community. It’s a loyal company, as they only hire graduates of the School of American Ballet, so there are people that I have known since I was fifteen. It’s like family. I think TM helps you be a little more fearless. Before, I would hold on to trying to be really perfect and also was kind of obsessed with certain technical steps. Now, it’s more of a bigger picture. I am enjoying my own performance more and taking every step and every movement to its fullest. But now that I’m stepping away from ballet for a year, I see how much pressure we are all under. We are never done working on being perfect. It’s never, “Oh, that’s great.” It’s always, “Oh, you need to get your leg higher; I need you to turn around one more time in that pirouette; or, wouldn’t it be better if your feet were pointed more?” It’s endless. Also, the ballet has a deeper meaning, and there is a lot of stress for the ballet dancer to uphold this legacy that is weighing on you every time you step on stage. Linda Egenes: I understand that it was stress that brought you to TM in the first place. Megan Fairchild: I would have panic attacks where I would pass out and be rushed to the emergency room. They were so intense that, literally, when I was regaining consciousness, I heard someone screaming, and it was me. One of my ballet masters at NYCB, who did TM, suggested that I try it. She was the consummate professional and always in the moment and ready to get her job done. I felt like, well, if she does it, and she swears by it, then I’m going to try it. Linda Egenes: So these episodes have subsided? Megan Fairchild: Yes. The last one was before I started TM. There have been moments that, in the past, would have caused me to get light-headed and possibly go into an episode, but now I watch the moment pass by without any big event. My level of pushing my body was up so high that, basically, a fuse would blow. With TM I turn my stress dial back a little bit every day instead of letting it constantly turn up and build on itself. Linda Egenes: How do you reconcile your own creative interpretation with the way the dances have been done in the past? Megan Fairchild: Even if you get to a point artistically where you are feeling free with your technique, you are also trying to uphold the tradition while you put your stamp on it. I am lucky to work with wonderful ballet masters who are supportive in making me feel like I am the artist here and now, and it’s OK if what I do is a little different from the way ten other really special ballerinas have done it in the past to great fame. My ballet masters tell me the steps, and I feel how my body wants to do it and what feels true to me. Linda Egenes: Does transcending in your daily TM practice help with balancing artistry with technique? Megan Fairchild: I think it helps you be a little more fearless. Before, I would hold on to trying to be really perfect and also was kind of obsessed with certain technical steps. Now, it’s more of a bigger picture, being completely in the moment of each step as it’s happening instead of worrying about that technical step coming up. I am enjoying my own performance more and taking every step and every movement to its fullest. I used to feel that things would stick to me like Velcro, and now, things just roll off. I still recognize moments happening that would normally frustrate me, but they just don’t irritate me as much as they used to. I am more able to deal with the stresses that come with my job. I think what makes a great performance is when you are free to dance to the music in a way that feels fresh and spontaneous and isn’t contrived. You are in the moment and reacting to the music as the orchestra plays it. In general, I have more patience with myself. Linda Egenes: In what ways? Megan Fairchild: Say I do a bad turn or I don’t feel my best that day, or maybe I don’t feel like always being in a leotard or something. TM helps me to let the little stresses that come with being a ballet dancer just roll off a little easier. I am a lot more resilient. I am not getting obsessed over the difficulties of working with this partner or that. It’s just a little easier. Linda Egenes: I understand that your brother is also a ballet dancer and is also taking a year off to star in the forthcoming Broadway musical, American in Paris? Megan Fairchild: Yes, my brother, Robert Fairchild, is three years younger than me, and he is in the NYCB and so is his wife. And I am married to a principal at the company, Andrew Veyette. So we have a little family. Linda Egenes: So your brother, Robert Fairchild, is following in your footsteps? Linda Egenes: I’m curious about the influences that made you and your brother both become professional ballet dancers? Megan Fairchild: My mom always liked musicals, and because I was dancing around the house, she took me to tap class when I was growing up. There was never any pressure to become a dancer. I’d be thinking, “Oh, wow! I like this!” Then “I like ballet,” so I would be in the Nutcracker; and then “Oh, this is going well. I am going to do ballet full time.” So it was always, “Oh, I enjoy this. Let’s go to the next level.” It was never a grand plan. Watch Megan Fairchild’s brother, Tony-nominated Robert Fairchild, perform at the Tony awards. For a writer, finding your personal voice is one of the most important parts of mastering the craft. It turns out that this is also important for visual artists such as Mindy Weisel. An oil painter who in recent years has turned to glass as a medium, Mindy Weisel has shown her work in solo shows in prestigious galleries and is the recipient of numerous awards. Her art appears in the Hirshhorn Museum, the National Museum of American Art, the Israel Museum, the U.S. Embassy, the Baltimore Museum of Art, and the Archives of American Artists at the Smithsonian Institution. Yet despite her success, Mindy says she struggled emotionally with each piece to discover what she wanted to say. She feels this struggle has its roots in her unusual childhood. Born in 1947 in Bergen-Belsen, Germany, in a displaced persons camp, she was one of the first children born to holocaust survivors after the war. “Growing up as the only daughter of holocaust survivors, I don’t think I had a clue what it meant to live my own life,” she says. Mindy did know she liked her art and literature classes in high school in New York City, where the family moved, and decided to major in art in college. But finding her place as an artist was daunting. Mindy continued her graduate studies at American University, and with the help of mentors she found there, she established her own studio by age 27 and launched her first solo painting show. But it wasn’t until she dug deep into her own personal experiences that she found her own voice and gained recognition in the art world. Created long before there was a holocaust museum, before Schindler’s List, Mindy’s paintings of 1978 were well received by art critics and laypersons alike and were shown in a traveling exhibition in museums around the country. For someone whose art is so personal and expressive, it’s hard to imagine that Weisel has ever struggled to find her artistic voice. Yet she identifies this to be her main challenge as an artist. Another dramatic shift for Mindy Weisel is that she is now using glass as a medium. Her colorful, light-filled glass wall paintings are a feast to the eyes. Mindy took classes at Pilcher Glass School in Seattle to learn her new medium, and just a year and a half later, her vibrant, colorful works appeared in a solo exhibition, “Words in a Journey of Glass,” at Katzen Art Museum, American University. Somehow Mindy finds time to express herself in writing as well. The author of five books, she recently completed her memoir, Making Marks, in which she writes about making marks of longing, of loss, of survival, of beauty. In comic strips a light bulb turning on inside a character’s head indicates a brilliant idea. For Dutch artist Jeroen Stok, a light bulb was the idea that set him on his career path as a sculptor and installation artist. 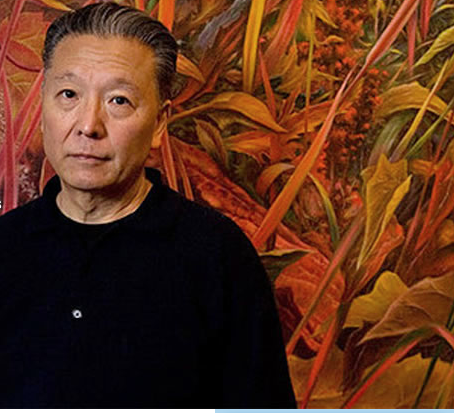 Trained as a painter at the Royal Academy of the Arts at the Hague, he spent a year studying art and consciousness at Maharishi University of Management in Fairfield, Iowa (then MIU). Back in the Netherlands, he took a step further into the realm of sculpture. “The pieces that I’d designed for the wall suddenly were standing by themselves,” he says. Fast forward 20 years, and Jeroen Stok, now 54, is a sculptor in demand, having created dozens of commissioned stainless steel sculptures for cities, villages, and universities, from Amsterdam to the California wine country. Using the medium of stainless steel, his designs evoke the beauty of nature, ranging from flowers to animals to the abstract, from one foot high to 20 feet reaching to the sky. In his early, uncertain days as an artist, Stok’s sculptures were made of bamboo and paper. Stok recalls a friend advising him, “Why are you working with such unstable materials? You should work with something like steel.” The idea resonated with Stok—his father owned a steel factory. Soon he had learned how to weld and bend the steel to match the images in his mind. A quiet man with a willowy build, Jeroen says that while working with steel, he has imbibed some of its power and strength. While stainless steel is a rigid medium, in his own life Stok is known for “going with the flow.” He credits his flexibility to practicing the Transcendental Meditation technique. As an installation artist working with government and civic committees, Stok has to create a design that will satisfy the disparate desires of the committee members, become a symbol of the organization or city, and appeal to the public for generations to come. For instance, in creating the three-story steel tulip design for the Netherlands township of Avenhorn, Stok realized that it was the mayor who was driving the project in the last months of his term. Jeroen had the insight that the mayor wanted above all to leave a lasting legacy and therefore would give him greater monetary and creative leeway in designing the project. After the committee approves the design and budget, craftsmen cut, weld and shape the raw steel into a refined sculpture. This stage also involves working with craftsmen who may have never fashioned steel into something this complicated before. Stok takes care to meet the workers and their families in their homes, and further motivates and befriends them by posting pictures of the project’s progress on a website. “Sometimes their families never see the work that they create in the factory, so when they see the sculpture developing on the website, it becomes something they can share, a source of pride for the craftsman,” says Stok. Despite working with others to create public works for generations to come, in the end, Stok’s art is deeply personal. As an example, Stok and his wife were expecting their son when he designed the Avenhorn tulip sculpture. “It was about the blossoming of life,” he says. Today their son is ten years old, and loves to climb on the public sculptures in town centers, gardens, and malls that his father has created. Living in Lelystad, a village in the Netherlands created for people who live together and practice Transcendental Meditation and the advanced TM-Sidhi program in a central meditation hall, the Stoks find that meditation also helps them to lead a more balanced family life. In recent years, Stok has received commissions from the U.S., such as two giant steel tulips for the city of Temecula, CA. They were looking for a tulip for their Duck Pond and Veterans Memorial park and found his work on the Internet. Stok attended the unveiling ceremony last September. In addition to his commissioned sculptures, Stok has also directed a considerable amount of his artistic talent to create better living conditions for handicapped people, and to urban developmental planning. Linda Egenes is co-editor of Enlightenment: The Transcendental Meditation® Magazine. She is the author of five books, including Super Healthy Kids: A Parent’s Guide to Maharishi Ayurveda, co-authored with Kumuda Reddy, M.D. An oil painter who in recent years has turned to glass as a medium, Weisel has shown her work in solo shows in prestigious galleries and is the recipient of numerous awards. 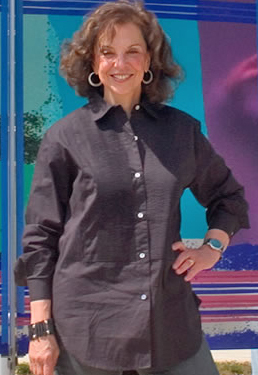 Her art appears in the Hirshhorn Museum, the National Museum of American Art, the Israel Museum, the U.S. Embassy, the Baltimore Museum of Art, and the Archives of American Artists at the Smithsonian Institution. She did know she liked her art and literature classes in high school, and decided to major in art in college. But finding her place as an artist was daunting. Weisel continued her graduate studies at American University, and with the help of mentors she found there, she established her own studio by age 27 and launched her first solo painting show. Created long before there was a Holocaust museum, before Schindler’s List, Weisel’s paintings of 1978 were well received by art critics and laypersons alike and were shown in a traveling exhibition in museums around the country. Yet as her art evolved, Weisel says she continued to struggle emotionally with each piece to discover what she wanted to say. She quotes the German artist, Hans Hoffman, and the Jewish philosopher, Abraham Joshua Heschel, who both said that an artist should not have a memory. Weisel took classes at Pilchuck Glass School in Seattle to learn her new medium, and just a year and a half later, her vibrant, colorful works appeared in a solo exhibition, “Words on a Journey of Glass,” at Katzen Art Museum, American University. Somehow Weisel finds time to express herself in writing as well. The author of five books, she is currently working on her memoir, Making Marks, in which she writes about making marks of longing, of loss, of survival, of beauty. James Meredith is not your typical classical musician. For one thing, he’s had a multifaceted career. As an accompanist he is a musical partner with mezzo-soprano Frederica von Stade and dramatic soprano Olivia Strapp. He is the founding director of the celebrated Sonos Handbell Ensemble, which has brought audiences to their feet twice on Garrison Keillor’s “Prairie Home Companion” show; given sold-out performances in multiple tours of the U.S., Asia, and Europe; and is widely acclaimed by music critics as the top handbell ensemble in the nation. He dons a third hat when he creates arrangements and original compositions for the group—all while maintaining a roster of piano and vocal students, 10 of them gifted students from the Young Musicians program at UC Berkeley, where he is a faculty member. Being accomplished in so many areas is not the only unusual thing about him. He is famous for handling the pressure of performance with grace, humility, and ease. Meredith says his secret is, ironically, the hours that he spends away from his music, closing his eyes to practice the Transcendental Meditation technique. While talking to Jim in his cozy Oakland home, I get the feeling that his life is composed of many moments of being in the right place at the right time. As luck would have it, his Greenville, North Carolina grade school was located in a college town and near the hall where the state orchestra performed, so he heard many concerts and had lessons from master musicians as part of his early education. Meredith started playing clarinet that same year, and inspired by a seventh-grade school friend, soon was teaching himself piano. Noting his gifts, his parents eventually agreed to pay for piano lessons and, lucky again, he was able to study with a gifted teacher who was a graduate of the music conservatory in Riga, Latvia. In college, he majored in piano at the University of North Carolina at Chapel Hill, and took his master’s in piano at Tulane University, both on scholarships. After graduation in 1969 he was drafted and found himself playing the clarinet in an army band in Germany. As luck would have it, a fellow piano player mentioned that he did something called Transcendental Meditation. It wasn’t long before Jim was instructed in the TM®technique. He noticed that he not only had more energy for performance, but he was able to understand the music at a deeper level. Drawn to the transcendental experience, Meredith became a teacher of the TM technique and taught full-time in Birmingham, Heidelberg (Germany), New Orleans, and Berkeley for 10 years. It wasn’t until 1983 that Meredith decided to return to music as a full-time profession, teaching private students and master classes at universities, performing as a solo pianist and accompanist, conducting the Oakland Symphony Chorus, and becoming chorus master of the Festival Opera. His work has taken him to Europe and Asia, and has brought him into contact with such artists as Elizabeth Schwarzkopf, one of the most renowned opera singers of the 20th century. Then in 1990, he became the founding artistic director of the Sonos Handbell Ensemble. “I knew from the start that I wanted it to be professional musicians playing classical music, with the tours and performances handled professionally,” he said. Jim is known in the profession as someone who doesn’t allow his ego to get in the way. Instead, he bends and flows with the harmonies around him. It is this humility and skill that endears him to his fellow musicians. “I cannot assemble enough kudos to do justice to our beloved Jim,” says the world-famous mezzo-soprano Frederica von Stade. Growth in intuition is something Meredith attributes to his years of Transcendental Meditation practice. He also feels it has opened up his creativity, making it possible to compose music. 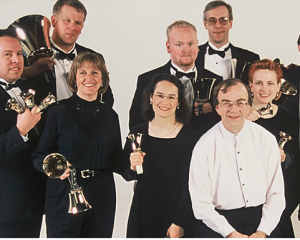 Since then Meredith has become a published composer, riveting audiences with his handbell pieces performed by the Sonos Handbell Ensemble internationally and on several DVDs. He also arranges most of the music the group performs. It’s late afternoon when we finish our interview and Alisa knocks on Jim’s door. A tall girl for just 13, she’s part of the Young Musicians Program, which gives gifted high school and elementary school children whose families could never afford it the opportunity to study with professional musicians in the San Francisco Bay area. For 15 years Meredith has taught, coached, and accompanied vocal students with remarkable results—all have attended top music colleges and conservatories, many on scholarships. “You seem quiet today,” Meredith says. She nods and says she is tired. Like every good teacher, he notices things about his students. Then he sits down at his Mason & Hamlin, a grand piano sitting beside a Bechstein grand that he once hauled across the country in a trailer along with a collection of potted plants, and starts to play scales while Alisa sings. After warm-ups, he reads a summary of Clair de Lune, a French love-song by Gabriel Fauré, and starts to play. Alisa opens her mouth and sings like a lark. It’s astonishing to hear such sophisticated music coming from a thirteen-year-old. As the lesson progresses to an Italian song by Rossini, Meredith asks her to assess her own singing. She says her voice is not as clear today, and he reminds her of certain breathing techniques, explaining how a performance musician would address a problem like that. When he asks her what some of the French words mean so she can create the proper feeling she’s right there with him. At one point he stops to talk to her. “You’re talented. You can move people with your voice. You must know this. And how does that make you feel?” he asks. “Good,” the girl says and smiles. She’s quiet and shy. Yet there is no doubt that at 13 she is already, thanks to Meredith, thinking of herself as a pro. When Keelan Dimick was three years old, he started tinkering on the piano. At first he taught himself to play by ear, then took two years of instruction in classical piano. But it wasn’t until he switched to jazz that great things started to happen. At age 13, just four months after taking his first jazz piano lesson, he won first place in the Lionel Hampton International Jazz Festival, junior division. Two years later, he won first place at the senior division and was recruited by top music schools. It turns out that Keelan had a secret weapon that set him apart from other contestants: his practice of the Transcendental Meditation technique. Right now he’s excited about opportunities that are popping up, including a New Year’s Eve gig in Santa Barbara with a big jazz band that will be playing Keelan’s own compositions. And he’s taking two months to help set up a jazz music program and train faculty at a Filipino university this fall. Keelan is one of thousands of young people who are turning to the TM technique not only to give them a cutting edge as students, but also to help them launch their careers in the competitive field of the arts. Take Dana Farley, age 22, a Long Island native who credits the Transcendental Meditation technique with helping her to overcome the challenges of dyslexia as well as teenage anxiety and depression. A chance meeting with director David Lynch started her on the path to TM and filmmaking. Aware of the high stress levels and a troubling rise in suicide rates and depression in American teenagers, Dana had the idea to create a documentary about her own TM experience. She started making the film in high school, and continued working on it even while an undergraduate at Bucknell University. Even though Dana majored in English, she joined a film club to get more practice behind the camera. Dana’s perseverance paid off. While still a junior in college her documentary Beyond the Noise: My Transcendental Meditation Journey, which featured David Lynch and Dana, was released and received a favorable response at the Marbella International Film Festival. Tanell Pretorius of South Africa has taken a different route—postponing college to pursue a glamorous London modeling career that included TV commercials for Sony PlayStation, catalogue work for Marks and Spencer, and shoots with Rankin, the legendary British photographer. But the long hours (one shoot started at 3:00 in the afternoon and lasted until 9:00 a.m.) and the pressure of constant self-scrutiny started to take their toll. At that point Tanell decided to leave full-time modeling and explore her love of learning at Maharishi University of Management in Fairfield, Iowa. A media and communications major, she is also earning certification as a Maharishi Ayurveda wellness consultant. She plans to use her skills in writing to share what she’s learned about health, yoga, and fitness with other women. “I’d love to help women to get more in touch with themselves, to work out and choose what to eat from an intuitive level rather than from what a magazine or an article is telling them to do,” she says. These three creative twenty-somethings have one thing in common—they all highly recommend the TM technique to other young people. Naoto Nakagawa comes from a long line of Japanese poets, artists, and philosophers. 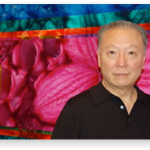 After growing up in Takarazuka, Japan, he emigrated to New York City as a teenager in 1962 and quickly established himself as a painter and performance artist. His paintings have appeared in over 25 solo exhibitions in leading New York galleries and in group exhibitions at the Guggenheim Museum, the San Francisco Museum of Modern Art, and the Venice Biennale. His work is included in many public and private collections in the USA, Europe, and Japan, including the New York Museum of Modern Art and the National Museums of Modern Art in Osaka and in Kyoto. 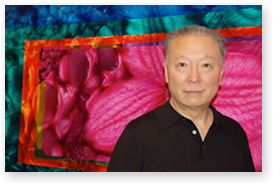 Nakagawa has taught and lectured at, amongst others, Columbia University and Parsons School of Design. 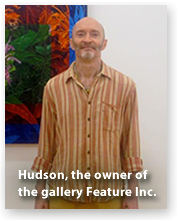 Hudson, the owner of the gallery Feature Inc., was profiled in the December 2012 issue of Art in America. As a dealer noted for introducing many popular artists, such as Jeff Koons, Richard Prince, Raymond Pettibon, Tom Friedman, and Takashi Murakami, he is a leading figure in the American contemporary art scene. One spring morning, Enlightenment met with Naoto and Hudson while they were preparing a solo exhibition of Naoto’s most recent work, his “Earth Wave Paintings,” at Hudson’s gallery. In this fascinating discussion, they explore the role of nature and consciousness in Naoto’s work as well as the influences of both the artist and gallerist in the process of making art. Enlightenment: How does nature play a role in your art? Naoto: In the area near Kobe where I grew up there is a beautiful river—the Muko River —and beyond it is the majestic Mt. Rokko. Almost every evening, I would sit on a rock in the garden and look at the mountain and watch that magical moment of nature—sunset—when the sky turns red, orange, and yellow. I saw hundreds of teeming bats, dragonflies, and mosquitoes, each aiming to eat the other. This abundance of nature is gone, unfortunately, as so many houses have been built there now. The beauty and magic of nature that I experienced is no longer there, but that experience is deep inside of me. I remember reading the autobiography of Arshile Gorky, an important artist who came to America from Armenia and is known to be the link between the European art movement and the American movement—a bridge from Picasso to Matisse to abstract expressionism. He painted symbolic nature, involving natural forms, abstractions, and life-and-death kinds of feelings. An interviewer once asked him, “Where do your images come from?” and he said they came from nature. He grew up in Armenia until he was about 13 years old, and the way he described his deep connection to nature there, I thought, “Wow! This is very similar to my own experience.” His creative process is like a memory. So I must be doing something like that, too. Hudson: Nature is probably the unifying factor in all the art that you’ve made. Each piece is a different expression of that central theme. 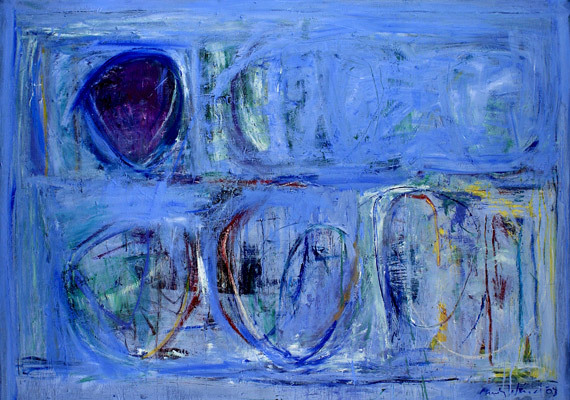 Enlightenment: Has the practice of meditation helped your painting to evolve in this direction? Naoto: Yes. If you look at my paintings up to 1972, they were very much about manmade objects, such as a comb making love to a stick of butter. I was thinking of a second, urban nature defined by Marshall McLuhan—a manmade world created by humans. There was no natural, organic thing, no trees or leaves or flowers in those paintings. 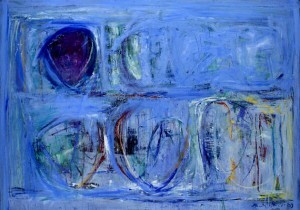 Then there is a perceptible shift in my paintings in 1973, only one year later. People often ask, “What happened to your art between ’72 and ’73?” I learned to meditate for the first time in 1972. I think before I started Transcendental Meditation I was a kind of artist-in-rage or something. I had arrived in this big city. I felt foreign. I felt alienated. At the same time I wanted to be accepted and to participate. And I had some very good dealers exhibiting my work. But when I began to meditate I went deep inside of myself for the first time. It was the thing I had been looking for, for a long time, but couldn’t find. And I think one of the wonderful things about practicing TM is that not only did it give me the experience of going deep inside, it also put me in touch with the source of my creative impulse. It gave me a knowledge of the wellsprings of my creative source in the deepest level of consciousness. We are always conscious of physical, tangible things, but TM gave me a tool to reach the source of thought. So that was a very big discovery for me. In my work, there was a dramatic transformation from my early paintings of almost violent encounters between objects to a new, deeper connection to and acceptance of existence and the things around me. In my new still life paintings, a mysterious connectedness between objects emerged, and a few years later, when I moved to Vermont, nature made an appearance in my work. It was as if I found a correspondence with my youth in nature-filled Japan. As the years have passed, nature has taken more of a central role in my work. We live in this vast universe and we’re very tiny, tiny beings, but we have inside us every attribute of the incredible universe. So the deeper I can go inside of myself, the more I should be able to bring new layers of perception to others. And when I began to meditate, it connected me to the universe; like a tube of electricity, it connected me. Naoto: Butter is sort of soft and organic, and the comb and scissors are sort of phallic symbols. And I think that this male-female combination, the manmade and the organic, continues today throughout my work. Hudson: In your most recent work, the concentric rectangles could represent the more masculine forms and the imagery of the foliage and flowers could be said to represent the feminine. You have that interplay occurring in much of your earlier work as well. While it appears differently, essentially it’s the same discussion. Naoto: Yes, I find that the fundamental nature of the creative process is the juxtaposition of maleness and femaleness. These two forces are opposed with each other but also they unite at the same time, so I like to put those two things together. About a year ago, I was at Carnegie Hall with my wife, listening to Beethoven’s Ninth Symphony with about 200 choral singers, and half were female and half were male. It was the most amazing experience, an absolute contrast of the masculine and feminine. I think the truth of the universe has very much to do with this combination. Enlightenment: This discussion reminds me of what art critic Eric Shiner wrote: “Naoto forces the viewer to make new associations, to think of alternative universes.” Another writer thought you could be called a mystical artist. What do you think of those comments? Naoto: I think that may have something to do with the way I grew up in Japan. I carry a lot of Japanese influences within me. I feel very connected to my grandfather, Kagaku Murakami, who was a kind of mystic painter himself. He practiced a form of tantric meditation, and he always meditated before painting. Kagaku is known as the last great literati painter. Literati means “scholar-painter”—a tradition that goes back 700 years in China and Japan. He died in 1939, so I never really knew him, but I heard many stories about him from my mother. He used to go up into the mountains and spend all day looking at nature, without sketching or drawing. I know exactly what he was looking for. Through his meditation he was getting in touch with the source of nature, the creative force. When he died a publisher compiled his writings into a philosophy of art. I have read that book many times because it contains much wisdom. He wrote, “The act of painting is a prayer in a secret chamber.” I really love this passage because it’s so private and so spiritual. His legacy may have something to do with the way I connect with nature. Enlightenment: One interviewer said something similar of your approach to your work—he described it as very devotional, very monk-like. Naoto: When you paint you are not on stage. I’m not an actor, not doing something to please someone. It’s a very private act, and in order for a painter—at least for me—to create something extraordinary out of the ordinary, I have to shut myself off from the world and allow my consciousness to go inside as deep as I can to bring something extraordinary to the viewer. And I know for myself, when I see something extraordinary in art, it opens my eyes to new meanings, it raises my consciousness, and creates this tenderness, an appreciation for humanity and for life. It’s like constructing a poem—a poet uses mundane words, but it’s how you put the puzzle together that makes it extraordinary. It’s the same with painting—everything I paint, whether it’s flowers or butter or scissors, is a mundane thing. But it’s how you paint it, how you combine them together, and the colors and the forms—if you can bring the magic out of them, you can make a great painting. That’s what it’s about. And I think that meditation is another vehicle to reach to the deepest level of my own consciousness, reflecting these beautiful forms. Enlightenment: Naoto, I’m wondering how Hudson nurtures your creative process and how you worked together to create this exhibition? Naoto: I don’t know how he does it, but Hudson has the ability to encourage, to draw something out of each of the artists he works with. My paintings have become more developed, more radical, more risk-taking. As a result, in many paintings I made a leap into completely new territory. 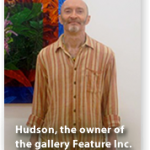 Hudson: Basically I observe, point to things or ideas, and make connections or comments; it is probably the underlying understanding, support, and appreciation that give strength to my presence. I don’t attempt to be definitive, as it’s the artist who has to make the decisions. In this type of situation, much like a lot of the art I enjoy, I generally prefer a communication that is tangential or loosely circles around things rather than addressing these delicate and complex matters directly. I keep it open; the artist hones it down. Naoto: And this may have something to do with us both being meditators. At first I didn’t know that he was a meditator. And I don’t think he knew that I was a meditator. I don’t know how we found out. I think there’s some kind of undercurrent, maybe something that we share deep down in our consciousness. Enlightenment: You’ve both been practicing the Transcendental Meditation technique for over 40 years. In addition, Hudson has learned the TM-Sidhi℠ program, which is an advanced program. Hudson, do you also feel that this ability to see into each artist is connected with your meditation practice? Hudson: Yes, of course. I feel there is an increased awareness that I have evolved to, and I feel that it comes out of meditation. It simply is. When you move from closing your eyes in meditation to opening your eyes and reengaging in the world, you feel that increased awareness. And after many years of doing that, the awareness lasts longer and it’s taken into the day. Naoto: Sometimes people comment that I am very centered. And I think that centeredness is like an anchor inside of me that’s really unshakeable. I think that meditating for so many years has something to do with this. Naoto: The mountain is in front of me. So I keep climbing and hopefully I can reach the summit. I’m probably halfway up now. Probably I’m dreaming, but my obsession is to create paintings that are the most incredible works of art. I originally wrote this article for Enlightenment: The Transcendental Meditation Magazine, Issue 7, June 2012. Reprinted with permission.